When sharing a team library, Notejoy allows you to specify what level of access each team member will have. Often you'll want all team members to equally contribute to a team library. But on occasion, you might find you want a small group of collaborators editing notes while the rest of the team is simply viewing or commenting. This can be helpful for sharing HR policies, onboarding materials, corporate communications, and more. By default, the creator of a library becomes the initial admin. They can then invite additional admins to help manage the team library if they choose. 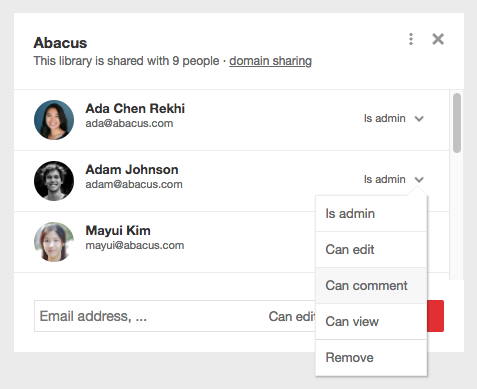 A user's permission can be changed at any time from the library sharing dialog. Just select the drop-down to the right of a team member's name and choose the new desired permission. Users can also request a higher permission when they are trying to complete an action for which they need additional permission. They'll be given an option to request permission from the library's admins and the admins will receive an email to approve the request. Sharing permissions can be used alongside domain sharing so that you can easily give everyone on your domain, say, Can comment permission and then give a small group of people Can edit permission. Note: Each higher permission includes all the privileges of all the lower permissions.